Here's a little more information about Rudkin Studio and about me, Jennifer Rudkin, the woman behind the whimsical animal sculptures. I was not always an artist. I used to be a researcher, professor, and writer in community studies and education. My identity shifted in 1996. A class I was scheduled to teach didn’t make enrollment and I found myself with a free evening. “Why don’t you come to my drop-in clay class,” a friend asked. I had not worked with clay since I was a child but my fingers remembered. They pushed into the clay and the clay would not let go. I knew I wanted to find a way to sculpt full-time. In 2005 two big events occurred in my artist timeline. I built my art studio and I adopted a mischievous labradoodle named Tupelo Honey. I call him my muse. Tupelo Honey is a joy motivated dog, which means he gets into a lot of trouble. He prances through the neighbors’ prize-winning roses and sleeps wherever he pleases –like on the dining room table. He knows how to stay open to the innumerable joys of a new day and reminds me that breaking rules in the spirit of adventure does not make you a bad dog (though people may forget this when they are mopping up). 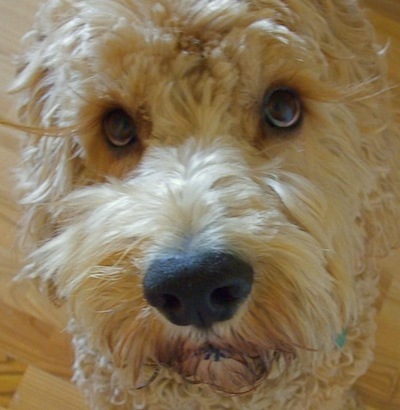 Every October I run a fundraiser in his honor for IDOG, a non-profit rescue for doodles. Starting a sculpture is lonely. It’s just me with my idea. I push and roll and squeeze the clay, all the time saying in my mind and in my hands “rhino” or “dragon,” trying to get the soul of the animal into the clay. At this point, creation is a monologue. Much faith is needed. 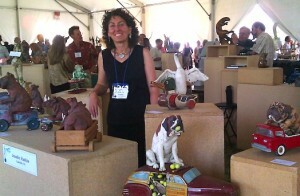 The magic and excitement come at some unexpected moment when the spirit of the piece begins to reside within the clay. It’s not just me anymore. Now there can be a dialogue. I try to help the piece emerge, but I have less and less responsibility for the conversation. When the sculpture is done, I am no longer necessary at all. If the piece is successful it will speak its rhino-ness or its dragon-ness on its own.